Lord Hazlerigg, Patron of the Naseby Battlefield Project, hosted the evening on September 12 that was attended by more than 100 distinguished guests from around the county. Althorp we have managed to raise over £6,000 for the charity. He said: “It saw the end of the Royalist army as a fighting force, and helped to bring forward the cause of democracy as we know it today. “I think it’s a national disgrace that we don’t have a memorial there, at Naseby, to remind people of this great moment in our history. 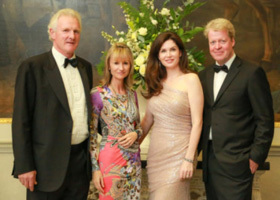 Charles, ninth Earl Spencer, released his new book, Killers of The King, published by Bloomsbury on September 11. The book tells the stories of the men who signed the death warrant of Charles I, a Spencer ancestor.